The Waring HPB300 MegaMix Speciality Blender is not only powerful and reliable but it is also incredible efficient at blending just about anything you can think of and its 1 hp motor is brilliant for ice crushing necessary for perfect smoothies and margharitas! If you are looking for an “all bells and whistles” machine with lots of little buttons to press and gadgets to play with, don’t buy this machine. If you are looking for a no frills, workhorse that will serve you reliably, time after time after time, this is the model for you – especially as it is on sale right now at just about half price – grab an amazing bargain! 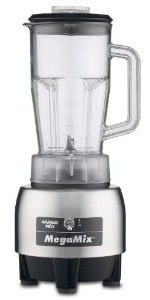 The Waring HPB300 MegaMix Speciality Blender has just the one metal toggle control which you use to adjust the two speeds. It has four angle blades that will rotate up to an amazing 27,000 rpm. The blender jar is a family-sized 48 oz capacity, lightweight polycarbonate plastic, designed to be durable and easy to use as it has a wide base to avoid accidental tipping and a neat, flexible lid with an insert which is removable for adding extra ingredients during blending. Easy to read markings on the side of the jar are calibrated in both liters and in ounces so it is easy to get the quantities exactly right, whichever recipe type you are following. Certainly reviewers had nothing but praise for this lightweight jug. If you have never used a blender like this before, you might be expecting the jar to lock onto the base but Waring have a clever design where the jar just sits on top of the clutch for ease of use. A useful feature with this blender is that it has non slip feet so it stays put on the countertop during use. The commercially rated motor on this model is covered by a manufacturer’s five year warranty and there is a one year warranty on all other components. One helpful reviewer pointed out that she previously had a Kitchen Aid Blender which uses a ‘rubber over metal’ coupler on top of the motor to spin the blade and if you make a lot of frozen fruit drinks this can break. The Waring Megamix uses a similar design but if you do have a problem with this component, she was able to purchase a new one for just $5.95 and fix this herself (whereas, as she pointed out you have to take the Kitchen Aid in for service to take apart the motor to get to this component from the inside) – this could be a big plus point for you if, like me, you make a lot of drinks with crushed ice. 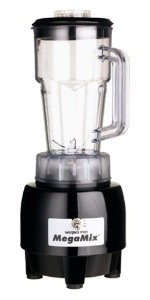 Overall, opinion of the Waring HPB300 MegaMix Speciality Blender? Customers love it! Reliable, durable, very powerful and blends in seconds. No frills design, simple controls, easy to clean and maintain. An absolute steal at the price – especially when compared to other commercial blenders with similar power and capabilities and you can read more and view the two colorways available (black and brushed steel) by using the link provided to the Amazon page.